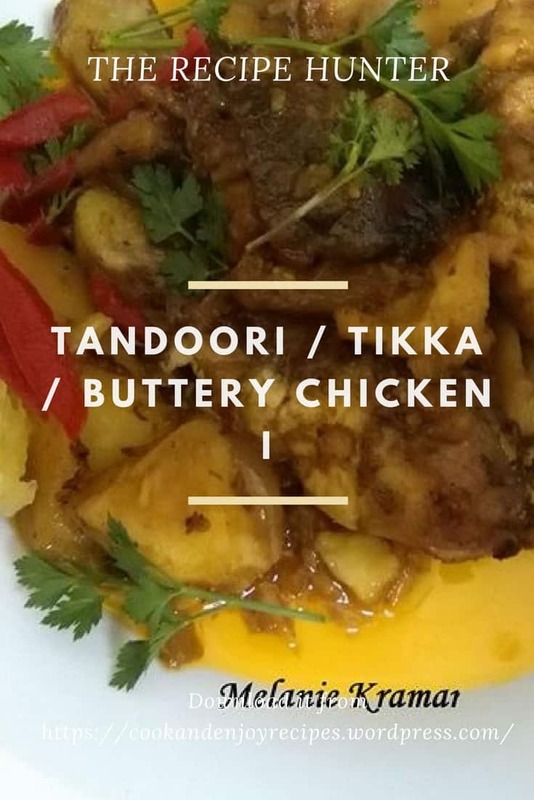 Experimenting with ‘some’ spices I bought lately, because every time I read a recipe it’s always Amina’s this or Amina’s that, so I decided to experiment with her Tandoori spice, Tikka Spice and Butter Chicken Masala in one dish and come up with a Tandoori Tikka Buttery Chicken. I will over time prepare these 3 dishes individually, but as I said, it was an experiment. Marinade the chicken in the Aminas marinades, the 2 salts, pepper, garlic and ginger and lemon juice for 4 hours. Parboil potatoes till 70% cooked, drain in colander sprinkle some salt and egg yellow and toss to coat. Leave to dry. Heat 1 tblsp ghee/butter and 1 tblsp oil in heavy based pan. Add onions and fry on low for about 10-15 minutes till tender and golden – do not brown. Add seeds and chilies and fry 1 minute. Add chicken, and brown slightly about 5 minutes. Add tomato paste and rest of ghee/butter. Reduce heat to low, cover and simmer till chicken cooked. Place potatoes between chicken (be careful not to break potatoes). Spoon buttery sauce over potatoes. Cover and continue to simmer for another 10 minutes.